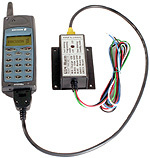 Long distance security / surveillance device using a GSM mobile phone. TVGA100-01 device is operable along with the Ericsson 868, 888, T10, T18, A1018 series of mobile phone. Controller to signalizings and monitoring the remoted objects apartments, garages, houses and etc with issue a warning signal on mobile telephones of standard GSM.